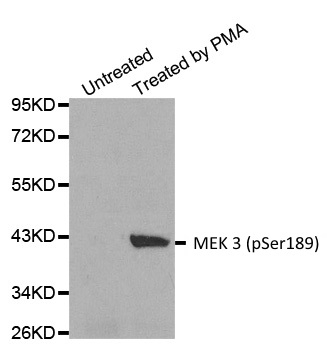 Rabbit anti MEK 3 (pSer189) antibody recognizes MAPK/ERK kinase 3 (MEK 3), also known as dual specificity mitogen-activated protein kinase kinase 3, MAP kinase kinase 3 (MAPKK 3) and stress-activated protein kinase kinase 2, when phosphorylated at serine 189. 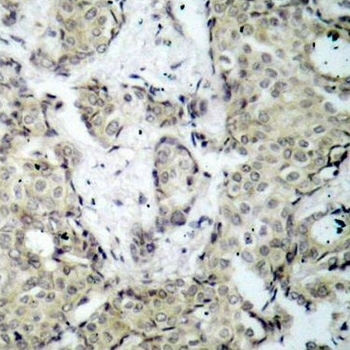 MEK 3 is a dual specificity protein kinase and a member of the MAP kinase family. MEK 3 plays a key role in the MAP kinase signaling pathway. MEK 3 is activated by phosphorylation at serine 189 (Zanke et al. 1996) leading to phosphorylation on downstream targets including p38 MAPK. Antiserum to MEK 3 (pSer189) was raised by repeated immunization of rabbits with highly purified antigen. Purified IgG was prepared from whole serum by affinity chromatography. Zanke, B.W. et al. (1996) Mammalian mitogen-activated protein kinase pathways are regulated through formation of specific kinase-activator complexes. J Biol Chem. 271 (47): 29876-81.